sausage – Damn, I Can Make That! This isn’t just any old meat and potatoes recipe. This is an Italian twist on the American version of a chili and cheese topped baked potato. I also love this meal because its a one pot, easy, fast, and filling week night dinner. I was inspired from a food network recipe that this originates from and just cant get enough of it. Sweat the onions and garlic in some olive oil. Once they are translucent add the ground sausage to brown. Cook down the arugula when adding the marinara sauce. Then stir in the marscapone cheese, to make the sauce a pinky blush color. In the mean time bake the potatoes in the oven and split in half when slightly cooled. Guys, we need to stop having #fomo just because we aren’t in Austin. I re-created the feel of being down there by coming up with these sumptuous lil appetizers. You know because us grown ups have people over for drinks and apps on the weekends. 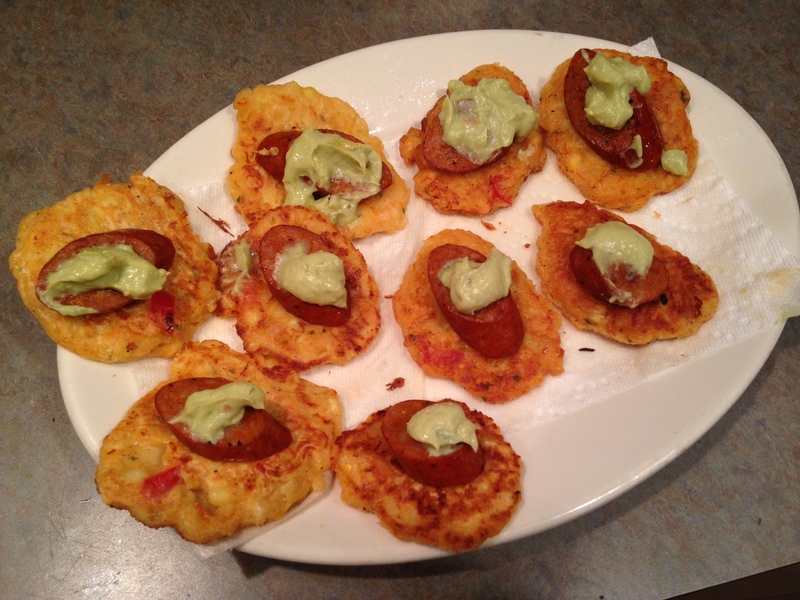 Anyway, I went real southwestern with my home-made corn cakes, topped with spicy andouille chicken sausage & a dollop of my avocado sauce. It was sweet, spicy, creamy, crunchy, and filling. Everything you’d want to coat your stomach with before a night of cocktails. Plus, if you drink enough it will be way easier to pretend like your actually at SXSW. 1/2 of a red bell pepper chopped small (should be around the same size of the corn kernels). 2 tsp. onion powder (I would even say thinly sliced green onion would be fab for this recipe, but I had to improvise with what was in my pantry. I am trying it with that next time though because this is a definite repeat dish). Mix the creamed corn, eggs, chopped red pepper, corn, baking soda, flour, and milk. Then fold in the spices & cheese. Then in a sauté pan heat vegetable oil at medium to high heat (you don’t want to scorch the corn cakes, but if the oil isn’t hot enough you wont get a nice crisp on the cakes). Use a large tablespoon to measure out the corn cake mixture evenly in the pan. Meanwhile, I sliced the store bought sausage and threw it in the oven at 350 degrees to roast & crisp up as I made the corn cakes. I’d say about 10-15 minutes (but mine were fully cooked, in case yours are raw increase the cooking time to 20-25 minutes or when browned). Fry spoonfuls of the batter until bubbles appear at the top & flip (like you would do with pancakes). Allow to cook on the other side and then in a paper towel lined platter, cool the corncakes so the excess oil is absorbed. No one wants to be able to taste the grease, but they do want crispy & yummy corncakes. The batter should make about 15 corn cakes (varies based on size). Layer with a slice of the warm sausage and a cold dollop of the avocado sauce. Nosh your face off. 1 pound sausage (I did Turkey vs. Pork and I also made sure it was hot Italian so the fennel seeds & other spices were already in there). (I added a lil bit of minced garlic. Technically not needed since the sausage was mixed with spices, but I like to jazz stuff up). Remove sausage from its casing and brown in a large pan. Add the diced onion and continue cooking on medium until the onions are soft. Remove the spine from the kale and chop into bite size pieces. (In order to avoid this work, because god forbid I don’t take short cuts, I bought the pre chopped & washed stuff from Trader Joe’s, its in the salad section). 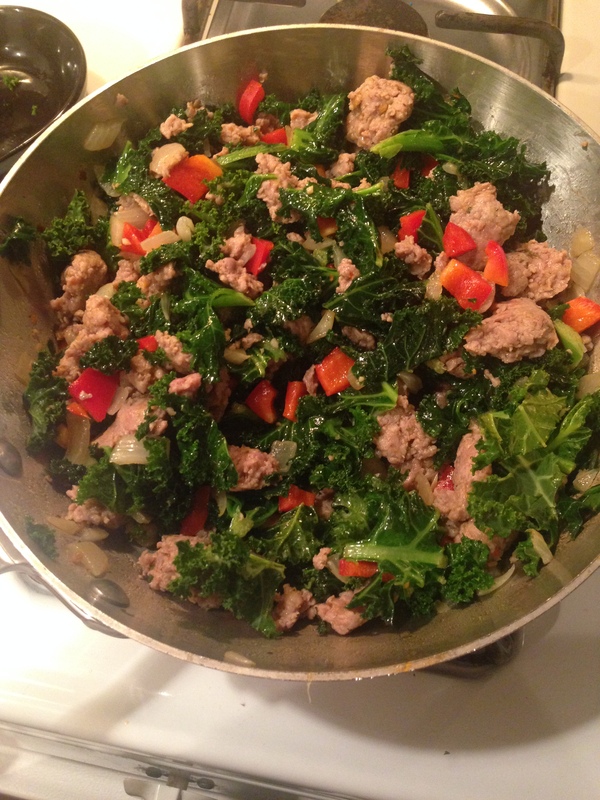 Then, add the kale to the pan with the sausage and onions and stir and cook until it turns bright green and softens to your taste. 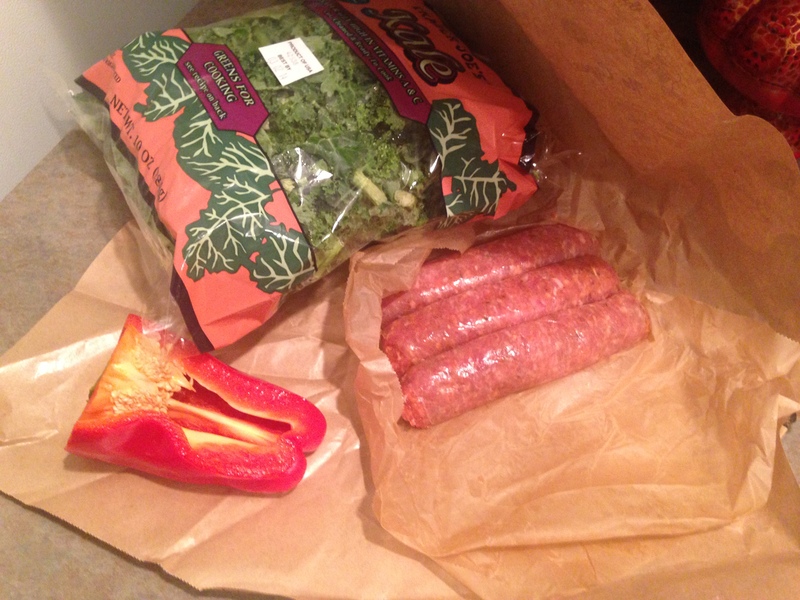 (Between 5-10 minutes) Remove sausage and kale mixture from the heat, stir in the chopped red bell pepper. Serve warm & feel proud of the fact you are so chic that you are eating kale, are gluten free, and partaking in a Paleo diet. Every single food buzz word for 2014, way to be a grade A trendsetter for the day.